Sony Entertainment are planning a unique reality TV show that will be aired over the PS3 Network in which one lucky individual will get to work as a games-tester for Sony. 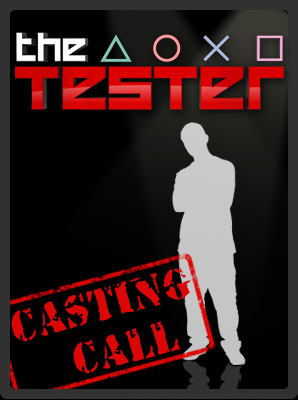 ‘The Tester‘ will involve a series of challenges, including gaming as well as finding out your knowledge of video games. This original program will challenge a select group of gamers in a series of tests to determine if they have what it takes to make it as an official Game Tester. The elimination competitions throughout the series will not only test the contestants’ video game knowledge, but they will also challenge the gamers’ memory, stamina, dexterity, and overall mental prowess. Contestants must have the whole package to take home the coveted prize in this new original series. That’s because the lucky winner will earn a contract position at Sony Computer Entertainment’s Quality Assurance department in San Diego, CA, where he or she will get hands on time with the most highly anticipated games in the industry. So, do you think you have what it takes to be ‘The Tester’. You can register your interest in taking part on Sony’s website.